When they have higher self-esteem and self-confidence, it empowers them; affirmations are just a great way to achieve that. A-Z, the Universe in Me is a collection of short poems, affirmations composed especially for children to hear and enjoy, to sing and repeat. Written in an easy-to-recite style and drawing parallels from nature, the simple poems focus on the fact that all qualities from A-Z in the universe are present in every child. The poems should be read out aloud enthusiastically to kids by parents, grandparents, or teachers. Affirmations can be powerful when the words “I am” are emphasized. Encourage your children to use them often, e.g., “I am kind,” or “I am grateful.” Affirmations work best when emotionalized and repeated daily. Singing and reciting the poems are fun ways to evoke emotion, which is very important to make affirmations effective. Children learn by observation and imitation; parents are powerful role models who can influence children if they habitually indulge in positive self-talk themselves. If parents use constructive language that reflects self-confidence, love, trust, and abundance, it’s the best gift they can give their kids in order to counteract the negative and self-limiting thoughts that children face every day. 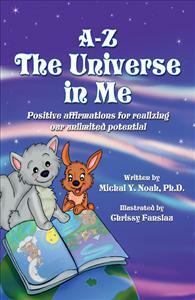 Affirmations, combined with positive emotions, are a powerful way to help us and our children manifest a joyful life. just a great way to achieve that. A-Z in the universe are present in every child. kids by parents, grandparents, or teachers. Affirmations can be powerful when the words “I am” are emphasized.